Natural Facial Rejuvenation repairs, improves, and renews the skin through a variety of procedures, products and technologies such as Cosmetic Acupuncture, Facial Microcurrent, Collagen Induction Therapy, nutrition, herbal medicine and botanicals, light devices, cosmeceuticals (a cosmetic that has medicinal properties, especially anti-aging ones) and other therapies and procedures that pertain to appearance-related wellness care. We address anti-aging and wellness from the inside-out. You must have healthy nutrition and proper digestion in order to nourish your skin. Anti-aging skincare (cosmeceuticals) are preventative and/or corrective and can be customized to your individual needs. We customize your treatment therapies and wellness routine, based on your individual needs. Fine lines, wrinkles, volume loss that contributes to sagging skin, eye bags, discoloration from sun damage and scarring can be addressed with Natural Facial Rejuvenation. Dr. McKendrick will tell you about available cosmetic options and then discuss all the benefits and side effects. As a board-certified Integrative Medicine practitioner, she is eminently qualified to perform these anti-aging procedures that provide you with a range of possibilities to regain a youthful appearance. As one aspect of Natural Facial Rejuvenation, Cosmetic Acupuncture tonifies muscles and increases circulation and blood flow to the face which results in a more youthful glow, skin tightening and reduction of fine lines and wrinkles. Cosmetic Acupuncture is a natural treatment, without the use of chemicals or invasive procedures, and works by using your body’s own innate healing ability. Additionally, the production of collagen and elastin is boosted so you keep that youthful look for longer. Our wellness and anti-aging practice is built around your needs and what you want to achieve. Our first question for you when you visit our clinic is “What concerns you the most when you look in the mirror?” We have several non-surgical, minimally-invasive options to enhance your appearance and self-confidence. We approach skin rejuvenation from a multi-dimensional perspective. Often, a combination of treatment therapies will give the best results. Our goal is to help you achieve your personal best. Let’s look at how the face changes with aging. We’ll look at the skin, fat, collagen, muscle and bone. You’ll see how the skin is impacted by the muscles and the deeper layers. Aging is going to happen, but looking aged and haggard doesn’t need to. There are many Cosmetic and Aesthetic treatment options to refresh your appearance. 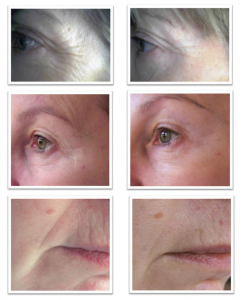 The facial aging process begins with the surface and below the surface structural changes in multiple facial tissue layers, including skin, fat, muscle and bone. Facial aging is due to changes in several types of tissue, including skin, fat, muscle, and bone. A youthful look depends on having the right amount of facial fat in the right places. As we age, the facial fat redistributes and shrinks which leads to facial volume loss. There is a significant loss of facial bone as we age. Aging of the facial skeleton may be due to changes in the dynamics of bone expansion and resorption and leads to volume loss. Without the structural support of bone, there are noticeable changes in the other layers of overlying soft tissue and skin. As you see in the above illustrations, aging causes changes to the facial structures; it’s a natural process. If you want to support the aging process without the negative effects, Natural Facial Rejuvenation is the best option for a gradual and healthy look. Depending on your needs, we may use one or a combination of the treatments listed below. The main usage is for the treatment of lines, wrinkles and creases, as well as bagging, sagging and volume loss. Cosmetic Acupuncture tonifies muscles and increases circulation and blood flow to the face which results in a more youthful glow, skin tightening and reduction of fine lines and wrinkles. This natural treatment is done without the use of chemicals or invasive procedures and works by using your body’s own innate healing ability. Additionally, the production of collagen and elastin is boosted so you keep that youthful look for longer. As you age, it is important to replenish the collagen that your body loses. Collagen supplements are also provided and discussed in order to enhance the body with a structural framework to hold hyaluronic acid and elastin and help restore the dermis. Hyaluronic acid attracts water molecules to the dermis and restores skin moisture. Elastin provides elasticity and helps the skin stretch. Various non-invasive treatments using therapy devices or machines. What kind of results can you expect and how long could they last?